Short Mountain Distillery has just had another celebrity visit. 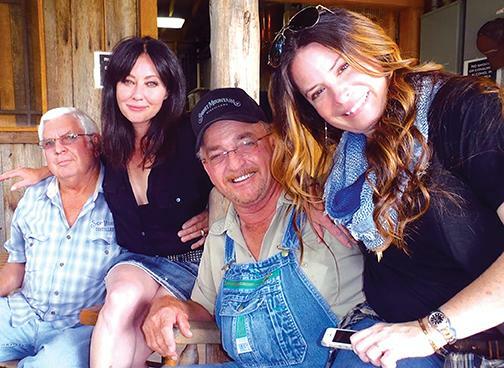 Shannen Doherty and Holly Marie Combs, who co-starred on the Charmed TV series, visited the distillery as part of their new travel show, Off The Map, which will be shown on Great American Country (GAC) in early 2015. The long-time friends shared with Short Mountain managing partner, Billy Kaufman, that they are taking a ‘summer vacation’ from their Hollywood lives to travel through Kentucky, Tennessee, Mississippi, Alabama, Georgia and Florida. They want to seize the opportunity to enjoy life in the South with the people who live there. According to the GAC sources, Off the Map is an opportunity for Shannen, Holly, and the viewers, to expand what it means to call America ‘home.’ Fans can vote on where they want the ladies to visit in each state on the GAC website. Drinking and making moonshine got the vote for what to do while touring Tennessee. “Both actresses were extremely personable and approachable,” said Kaufman. “They drank shine, made shine and generally had a great time. Just a few months earlier, Short Mountain Distillery was revealed as a shooting location for Sage + Saints new music video “Take Me to the South,” co-directed by Kristen Stewart of Twilight fame. Something about the laid-back atmosphere makes stressed out stars relax and smile. Shannen and Holly were no exceptions. “Local pickers came to the distillery at Shannen’s request,” Kaufman shared. “They played some original music and also played some old favorites to entertain the visitors while they ate moonshine-laced bread pudding made by local restaurant, The Blue Porch. While at the distillery, Doherty and Combs learned that Kaufman’s moonshine recipe is possibly the most pedigreed in the business. His recipe has a history that can be traced back to the days of Al Capone. His ‘Shiners tell stories of their grandfathers and great grandfathers selling their illegal wares to the famous mobster during prohibition. Short Mountain Distillery is located on a 300-acre organic and sustainable working farm that produces much of the grain used in its moonshine, as well as beef. For more information about Short Mountain Distillery go to www.shortmountaindistillery.com. Off the Map will be seen on GAC in early 2015 according to information provided by the channel. To follow the show as it happens, check out #ShannenandHolly on Twitter or vote on where Shannen and Holly visit next by going to www.gactv.com.